Is Kat Von D losing her hair? Radar Online is reporting that famous tattoo artist is so stressed that she is losing her hair. According to a close source, the stress of her recent break-up/make-up with fiancé Jesse James, along with her TLC show being canceled have attributed to her going bald at such a young age. If these accounts from the source are actually true there are two conditions that may be occurring with Kat. 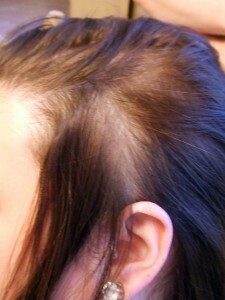 She is likely suffering from Telogen Effluvium or Alopecia Areata. Without seeing pictures of the hair loss these diagnoses are purely speculation from the above description. Can stress really make your hair fall out? Absolutely! Telogen effluvium is a scalp disorder characterized by massive hair loss as a result of early entry of hairs into the telogen phase. Emotional or physiological events may result in an alteration of the normal hair cycle. It may be due to a variety of causes, eating disorders, fever, childbirth, chronic illness, major surgery, anemia, severe emotional disorders, crash diets, hypothyroidism, and drugs. Typically a person with telogen effluvium will experience the hair loss approximately 3-4 months after the stressful event. The good news about this condition is that it is usually temporary and all of your hair will most likely grow back. If Kat had bald spots that are completely hair free she would most likely be suffering from a condition called Alopecia Areata. Alopecia areata is a hair loss condition where your immune system mistakenly attacks your hair follicles. You will usually see hair fall out in clumps and are left with round patches that are completely bald. Alopecia Areata can not only affect the scalp but it can also affect facial hair such as eyebrows or beards in men. Typically hair will grow back in 6-12 months. The most common treatment for Alopecia Areata is cortisone injections into the bald spots. 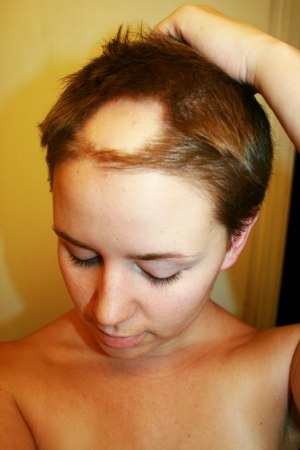 Hair loss for anyone, women especially, can be devastating. 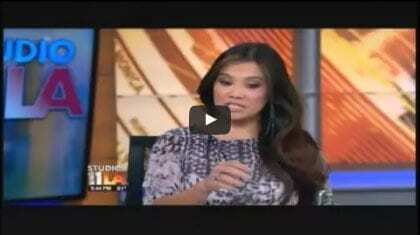 Consulting your health care provider for treatment options can be beneficial. This entry was posted on Wednesday, September 14th, 2011 at 7:01 am	and is filed under Celebrities. You can follow any responses to this entry through the RSS 2.0 feed. You can leave a response, or trackback from your own site. Do you think an exercise obsession is healthier than a plastic surgery obsession? Or just as bad? This entry was posted on Wednesday, June 22nd, 2011 at 8:37 pm	and is filed under Celebrities, Cosmetic Surgery. You can follow any responses to this entry through the RSS 2.0 feed. You can leave a response, or trackback from your own site.